Don Hlus has performed throughout Southwestern British Columbia as a soloist as well as a chamber musician, including performances with members of the Vancouver Symphony Orchestra, the Vancouver Opera Orchestra, and the CBC Radio Orchestra. 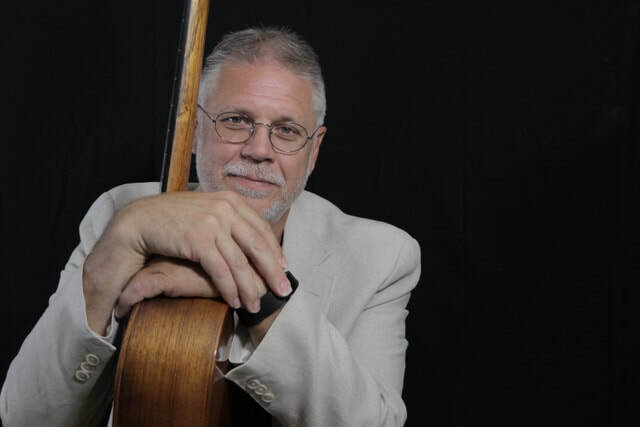 Although his formal training was on the classical guitar, his musical interests extend to include a wide variety of music styles, including acoustic fingerstyle, jazz, world, Flamenco, and Celtic music. Don has been on Faculty at Kwantlen Polytechnic University (KPU) since 1993 and served as Chair of the Music Department from 2012-2018. He is currently the Director of Guitar at KPU. He is also the Founder and Artistic Director of the Fraser Valley Acoustic Guitar Festival, now entering its twenty-second season. Don has championed the inclusion of courses that focus on career development and entrepreneurship in the KPU music program. Courses he has developed and taught include an Introduction to the Music Industry course as well as a Business of Music course. Prior to Don's first foray into the music for classical guitar (under the tutelage of Dennis Olsen), he studied jazz composition & arranging and jazz guitar at Capilano College. Don later attended the University of British Columbia where he was the first person in Western Canada to receive a Bachelor of Music degree in classical guitar performance, studying under the guidance of Michael Strutt. He has performed in master classes conducted by Elliot Fisk, Mark Teicholtz, William Kanengiser, Scott Tenant, Benjamin Verdery, Paul O’Dette, and Stephen Robinson. Post-graduate studies were with the Canadian guitarist Harold Micay. Don then went on to complete his Masters Degree at UBC in Higher Education. His research examined how different educational beliefs and values affect the design, development, and implementation of curriculum. In addition to his duties at KPU, he teaches privately in Fort Langley, BC and he is a member of the Canadian Music Festival Adjudicators' Association and the British Columbia Registered Music Teachers' Association (South Fraser).